Buffalo State graduates from the Classes of 1956 and those from class years 50 or more years ago who belong to the Alumni Association’s 50-Plus Club attended Reunion Weekend, which was held July 16-17. 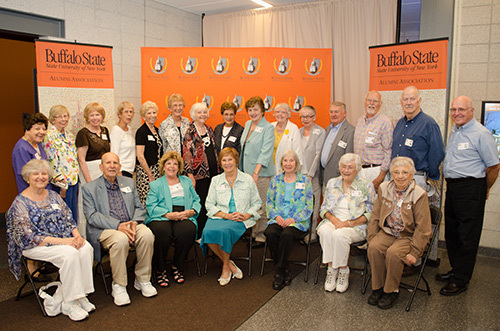 Members of the Class of 1956 joined their classmates on July 16 for a luncheon at Technology Building lobby at Buffalo State honoring the 60th anniversary of their graduation from "State." The group enjoyed sharing fond memories and mingling with friends! Meanwhile, members of the 50-Plus Club gathered on July 17 for their annual reception and luncheon, which was held at the Buffalo Yacht Club. The 50-Plus Club honors graduates of Buffalo State who have reached and passed the landmark of 50 years since graduation. A roll call of classes was held, and Dr. Dorothy Pieniadz, ’45 was the recipient of the 2016 Senior Service Award. The event's emcee was Latrese Myers, '08, who serves on the Alumni Association’s Board of Directors. The Class of 1966's 50th Class Reunion is being planned for Saturday, September 24 during Homecoming Weekend. More information will be announced at a later date. For additional information on all events, please contact the Buffalo State Alumni Association at (716) 878-6001, or email alumni@buffalostate.edu. The 50-Plus Club honors graduates of Buffalo State who have reached and passed the landmark 50 years since graduation! Meet members of this special alumni club and be part of this annual tradition.